Air Mail: HALF the price of shipping by DHL! What is Air Mail delivery? Air Mail delivery of Chinavasion electronics is a cheap, safe way of sending goods in small packets by air freight. Packets are first delivered by truck from China to Hong Kong, and then entered into a special registered Air Mail system in the Airport. How much does it cost to send electronics from China to my country with the Chinavasion Air Mail option? Please login to your Chinavasion.com account and preview shipping fees for different items in your shopping cart. For a light package under 0.5kg the shipping will be less than $10. Around 10-20 days to your door, after dispatch from the Chinavasion warehouse (allow up to 1 week for dispatch, after QC inspection and packing, dependent on item and quantity). Can I track the shipment? Yes: You can track your Air Mail shipments online using the Hong Kong Post website here or Singapore Post website here. Click here to find a list of national post offices offering online tracking in the destination of your goods. Yes, Chinavasion will guarantee against delivery exceptions and damage in transit. Delivery issues are rare with this systematic, professional service, and goods are packed securely by Chinavasion. Whenever you are importing, you may be liable for duties or taxes when the goods arrive in your country's Customs. The rules are different in every country and we advise you to check in advance. In countries with strict Customs regulations, shipments arriving in Postal packets typically experience fewer clearance delays / charges than courier shipments. What kind of items can go through this Air Mail option? Any of the items you see listed on Chinavasion.com (except pure battery) can be shipped to you / your customers by Air Mail. However, there is a total weight limit per package of 2kg. Above this weight, only courier options will be available. 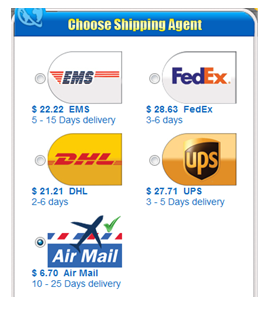 Can I use Chinavasion's Air Mail delivery for dropshipping? Yes, Chinavasion offers dropshipping (delivery direct to your customers) for no extra fees. The package does not refer to Chinavasion so your customer will remain loyal to you.